It’s hard to know the PH value and the chlorine level just by looking at the color of the test paper because the color cannot be identified easily just by human’s eyes. That’sÂ why we recommend this innovative design product for you. 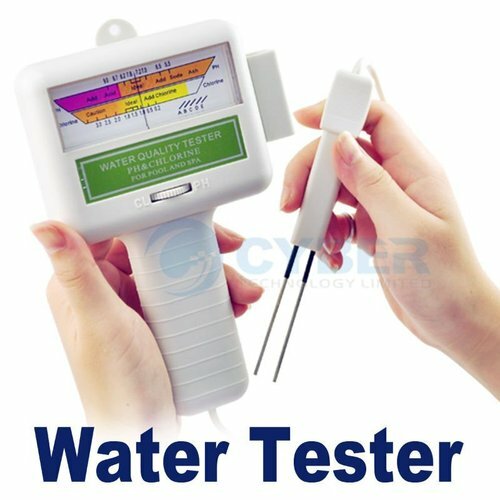 This meter can test water pH and CL2 easily. Quite an essential tool for swimming pool and spa. Ideal for simple operations to test water PH and CL2, no more chemicals or no more guess work. Large screen shows the test result on both PH and Chlorine level for easy reading. No chemical agent needed, easy to use it. Easy to use and obtain result instantly and accurately. Recommended Chlorine Level for pools and spas is 1.2 to 1.7 ppm. Recommended PH Level for pools and spas is 7.2 to 7.8. You can save time and money with this electro-tester. Light weight and easy to carry around.